Delays, delays. I had been secretly aiming for an early release of Sky Madness, but unfortunately I’ve eaten through my time cushion. My expected release date is now August 1. I am currently working with a small beta testing team to iron out the bugs, in an effort to avoid posting a whole bunch of follow-up builds. I have found a great musician for the soundtrack, and am in the process of inserting the music, making sure to add a mute button this time. This is going to be a terrific game. I hope that you will love it and decide to support my efforts by purchasing the full version. This entry was posted in Sky Madness on July 18, 2009 by admin. Some of you may have tried my latest flash game, Bathroom Simulator. Although the game is not a new concept, and certainly not my invention, I enjoyed creating my own version of how I thought the game should be, with my own graphics, sounds and personal rules of bathroom etiquette. Before releasing it as a free flash game, I actually developed the game as an iPhone application using xCode. Unfortunately, I ran into a major issue when it came time to submit the game to iTunes Connect, the agency used to collect applications from developers like me. My digital certificate was either invalid, or appeared invalid. Digital what? That was my reaction, after investing 20 hours in the project, only to hit a barricade at the very end of the process. Well, I was not alone. I googled the issue and found others who had a similar experience. Many of whom I spoke with had managed to resolve the issue, but not me. Being new to xCode and iPhone programming, this was extremely frustrating. Now I was investing even more hours trying to resolve an issue that still exists somewhere deep in the guts of my app. At that very time, Airport Madness 2 was gaining traction. I became busy with adding features, answering emails and squashing bugs, and decided that AM2 was more worthy of my attention than the iPhone app. So I shelved it. One month later, somebody else beat me to it, and their iPhone application became the #1 freebie for over a week. Ouch. The experience kind of turned me off of iPhone programming, and so I decided to go ahead and launch Bathroom Simulator anyway, as a free online flash game. It’s done OK. Since then I’ve totally embraced Flash, Flex and all things Actionscript. 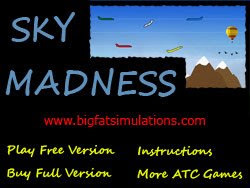 My next game, Sky Madness comes out in a week, not as a continuation of Airport Madness, but more as a close relative of it. 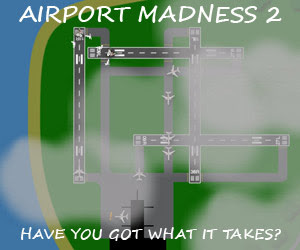 I also have two other flash games that I am working on, and have also promised everybody that there will be updated builds for Airport Madness 1 and Airport Madness 2 by the end of August. I am planning to port these games over to the iPhone in the near future. As I code up these flash games, my Macbook sits lonely on a shelf in my den, beckoning me to flip the lid and fire up xCode. Even my Actionscript hero Keith Peters, who has taught me just about everything I know of Flash through his wonderful books, has moved on to iPhone development. Although I intend to make many more Flash games, it makes sense to put these games on more than one platform, if possible. Maybe I’ll develop them for the Android as well. This entry was posted in iphone games on July 14, 2009 by admin. This game obeys my new law, “less realism, more fun”. To be a successful game, the fun factor definitely has to be there. Aside from a small die-hard group of ATC simmers out there, the masses just aren’t looking for uber-realistic ATC games, so I am trying to come up with ways to simplify and intensify the game experience here. 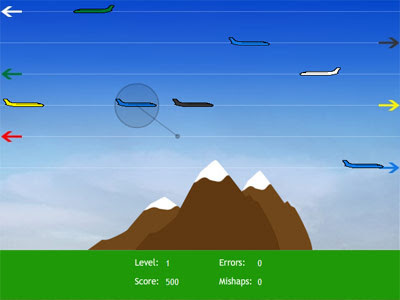 The idea is to climb or descend all aircraft to their correct flight level without hitting any mountains, blimps, birds, restricted airspace or other aircraft. From my initial beta testing, I can tell you that it is definitely not as easy as it looks. I had intended to have this game ready by now, but had to abandon an original control interface concept that involved UP and DOWN buttons. All that mouse-clicking really sucked away the fun, so I’ve gone with a click-and-drag concept to reassign flight levels to aircraft. There will be a free version and a full one. The full version will offer more levels, a continuous-play option, no ads, and will sell for just $4.95. The code is still wet (so to speak) so if you have any suggestions, please email me. I really hope to make another successful game from this 2D sky concept. This entry was posted in Sky Madness on July 9, 2009 by admin.